The new Porsche 718 Cayman is in its third generation, with a 300 horsepower 2.0 liter engine has a starting MSRP of $54,950 (including the $1,050 delivery, processing and handling fee) and the 718 Cayman S with a 350 horsepower 2.5 liter engine starts at $67,350. Both are on sale now and will reach U.S. dealers in late November 2016. Following the debut of the new 718 Boxster, the new 718 Cayman complements the roadster in the mid-engine model line-up. The 718 Cayman with PDK and optional Sport Chrono Package reaches 60 miles per hour in 4.5 seconds to a top speed of 170 miles per hour and the Cayman S accelerates from 0 to 60 in 4.0 seconds to a top track speed of 177 miles per hour. The new Lexus IS, shown at the Beijing Auto Show, has a fresh new look for its three models. The rear-wheel-drive IS 200t will be powered by the recently-added 240 horsepower 2.0-liter twin-scroll turbocharged inline-4 with intercooler, which comes mated to an 8-speed automatic transmission. The new IS’s safety equipment includes the Pre-Collision System, Lane Departure Alert with Steering Assist, Automatic High Beam and Radar Cruise Control. 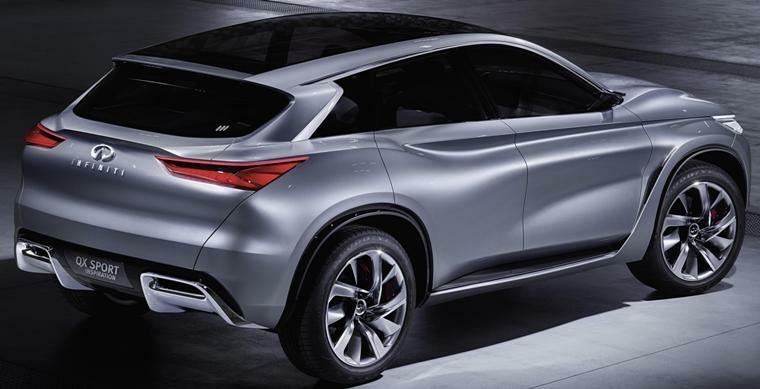 The Infiniti QX Sport Inspiration, the brand's vision for a next-generation, premium mid-size SUV. J.D. Power, the global marketing information services company best known for customer satisfaction insights based in Weslake Village, California, is being sold by McGraw Hill Financial after 11 years of ownership to London-headquatered XIO Group, a global alternative investments firm, for $1.1 billion in cash. The transaction is expected to close during the third quarter of 2016, subject to regulatory approvals and customary closing conditions. J.D. Power's prominent automotive studies include: U.S. Vehicle Dependability Study, U.S. Automotive Performance, Execution and Layout (APEAL) Study, U.S. Initial Quality Study (IQS), U.S. Tech Choice Study, U.S. Driver Interactive Vehicle Experience (DrIVE) Study, and U.S. Original Equipment Tire Customer Satisfaction Study. J.D. "Dave" Power III established J.D. Power in 1968 from his kitchen table, with a primary focus in the automotive industry. In 2005, J.D. Power was acquired by The McGraw-Hill Companies for an undisclosed sum believed to be around $400 million. Headquartered in London, XIO Group has operations in the United Kingdom, Germany, Switzerland, Israel, Hong Kong and mainland China. XIO Group's strategy is to identify and invest in market-leading businesses located across North America and Europe and help these companies to capitalize on untapped opportunities in fast growing markets, particularly in Asia. On April 27, 2016, subject to shareholder approval, McGraw Hill Financial will be renamed S&P Global to reflect a their direct focus on the financial intelligence businesses. Tesla Model 3, with seating for 5 adults, autopilot safety features and designed to exceed a five star safety rating, achieves 215 miles of range per charge with a zero to 60 mph time of under 6 seconds. Supercharging is standard. The price starts at $35,000 before incentives, like a $7,500 Federal rebate. Deliveries begin in late 2017 with orders being taken now at the Tesla website with a $1,000 deposit. As of last night at the Tesla Model 3 launch, Tesla founder Elon Musk said orders had reached 115,000 in the first 24 hours. Musk is confident its Freemont, California, factory can produce 500,000 a year. Batteries will be made at its gigafactory which will produce more lithium-ion batteries than anywhere else in the world combined in a building to have the largest footprint of any building in the world. General Motors delivered 252,128 Chevrolet, Buick, GMC and Cadillac vehicles in March, a 0.9 percent increase, and 193,524 to individual or “retail” customers, up 6 percent year over year, driven by a 7 percent increase at Chevrolet and a 13 percent increase at GMC. Year-to-date sales of 683,698 is slightly less than the year ago first quarter. Ford Motor Company sold 254,711 vehicles in the U.S. in March, an 8 percent gain versus a year ago, while first quarter sales of 645,626 vehicles were up 9 percent, for the best sales performance for March and first quarter since 2006. Toyota Motor Sales, U.S.A. reported March 2016 sales of 219,842, a decrease of 2.7 percent from March 2015. Toyota division posted March 2016 sales of 189,644, also down 2.7 percent Lexus posted sales of 30,198, down 2.8 percent. Year-to-date sales of 569,079 is a 1.1percent decline from last year. FCA US (Chrysler, Dodge, Ram, Jeep, Fiat, Alfa Romeo) reported U.S. sales of 213,187, an 8 percent increase compared with March 2015, and the group’s best March sales in a decade. Year-to-date sales of 551,103 is a 9 percent rise over 2015. American Honda reported March sales of 138,221, an increase of 1.3 percent for the month. Honda Division sales were 123,369, up 10.5 percent while Acura sales totaled 14,852 in March, gaining 1.2 percent. Year-to-date Honda and Acura sales are 357,703, a gain of 7.1 percent over 2015. Nissan Group announced total U.S. March sales of 163,559, an increase of 13 percent over the prior year. Nissan Division finished March with 149,784 sales, up 13 percent, a best month ever record. Infiniti reported sales of 13,775 vehicles in the U.S. during March, an increase of 10 percent versus prior year. Hyundai Motor America reported its best month ever, selling 75,310 units in March. Year-to-date sales of 173,330 is the best first quarter ever, up 0.9 percent from 2015. Kia Motors America announced March sales of 58,279 down slightly from a year ago but pushing first quarter sales to a record of 146,321 vehicles, up 3.7 percent from 2015. Subaru of America reported record sales for March 2016 totaling 49,285 vehicles, a supply-constrained 0.4 percent gain over March 2015. The company also reported year-to-date sales of 132,397 vehicles, a 0.9 percent gain over the same period in 2015. March marked the 25th consecutive month of 40,000+ vehicle sales for the company, as well as the best first quarter in the history of the Subaru franchise. Volkswagen of America reported March sales of 26,914, down 10.4 percent from a year ago. Year-to-date sales of 69,314 is a 12.5 percent decline from 2015. Separtely, Audi reported March sales of 18,392 vehicles sold, an increase of 7.5 percent over the same period last year. Year-to-date sales of 41,960 vehicles is an increase of 4.6 percent over 2015. Sales of BMW brand vehicles decreased 12.5 percent in March for a total of 30,033 compared to March, 2015. Year-to-date, BMW brand is down 10.0 percent on sales of 70,613 compared to the first three months of 2015. Mercedes-Benz USA reported March total sales of 31,715 with the Mercedes-Benz brand having sales of 28,164, which closes the first-quarter at 75,769, down 3 percent from last year. Smart contributed 479 and Vans reported a best-ever March with 3,072, up 29.1 percent from the same time last year. Mazda North American Operations reported March U.S. sales of 23,396 vehicles, representing a decrease of 27.2 percent versus last year. Year-to-date sales through March are down 17.2 percent versus last year, with 64,643 vehicles sold. Mitsubishi Motors North America reported its best March sales since 2007 with sales of 11,078, an increase of 13.5 percent over March of 2015. Total sales for the year through the first quarter of 2016 are 25,212, up 6.0 percent compared to the same period last year. Volvo Car USA reported U.S. sales of 6,857 vehicles, a 15.9 percent increase versus March 2015. Year-to-date sales are up 19.2 percent. Porsche Cars North America announced March 2016 sales of 4,323 vehicles up slightly from a year ago raising first quarter sales to 12,238, 7.1 percent higher in comparison to the same period in 2015.